We had a great day today. We ate too much, laughed too much and just really enjoyed the day. This was my 3rd wheat, grain and gluten-free Thanksgiving. I remember how daunting my first one felt. The 2nd one was much better and by the time today's, my 3rd one rolled around...it was just 2nd nature and seemed normal. Even though the others in my family aren't grain free, I find that I have gotten so much better at creating and duplicating old favorites that most of what they are eating for holidays is grain free, too. This year I enjoyed turkey, dressing, creamy cauliflower mash, green bean casserole, squash casserole, sweet potato casserole, fresh cranberry sauce and buttermilk biscuits. For dessert I enjoyed a pumpkin custard cup topped with toasted pecans and whipped cream. This year one of my sons joined me in a totally grain free Thanksgiving dinner. The only thing he had different than me was he had mashed red skin potatoes like the others instead of the cauliflower mash. I snapped a quick photo of my plate. I'm posting it now well after midnight before going to bed. We actually enjoyed a "be here now" gadget free evening...no Facebook, texting, or cell phones. It was actually nice to spend an entire evening with just each other and without everyone staring at their phones communicating with everyone other than who they are actually with. We told stories, laughed, played games, watched a movie without the continuous distraction of everyone playing with their phones. It was a refreshing change that I'd like to see happen more often. I hope everyone enjoyed their Thanksgiving. Enjoy! 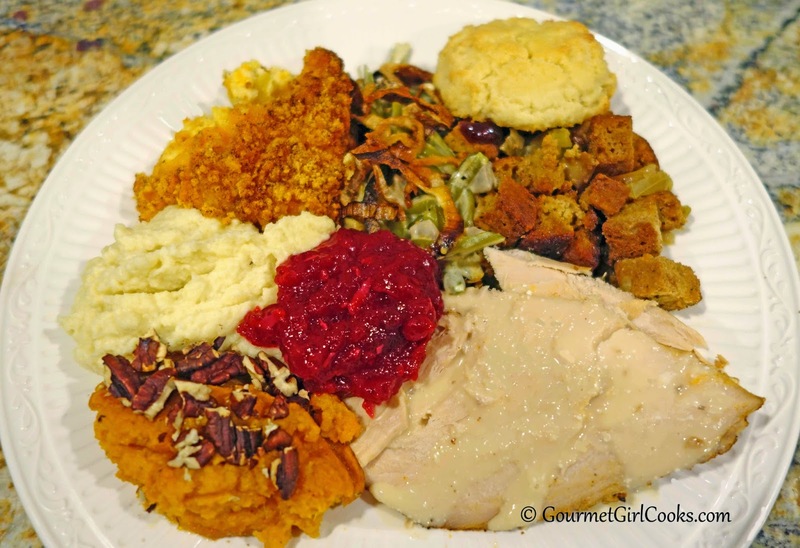 This was my first low carb Thanksgiving and I found it to be fairly easy. The only thing I really missed was the stuffing, and I could have avoided that with a little more research and preparation. Your plate looks amazing and is inspiring me to keep at it and next year will be even better! Just a note to thank you for the lovely Pumpkin Custard recipe. Tried it and now it is my favorite dessert!! Everyone loved it and I plan to make it all winter. Been low carb low FODMAP for nearly 2 years and will never go back. Thanks to people like you it is an easy lifestyle to embrace!